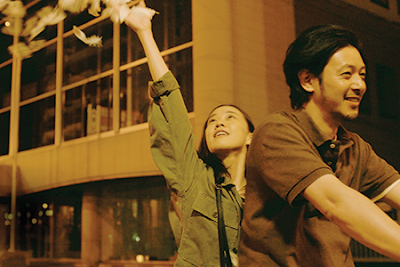 The centerpiece film at this year's Japan Cuts, like the opening and closing films of the festival sold out over four weeks in advance of screening. While could figure out why the other films sold out I wasn't quite sure why this one did until I saw it and I realized that the film was going to have admirers who were spreading the word as it being a must see. Joe Odagiri plays a divorced man who has retreated to his hometown of Hakodate. Enrolled in a vocational school for carpentry he is trying to get his life back on track. He is severely damaged by his past. Along the way he meets a kind of free spirited, but equally damaged woman played by Yu Aoi. As the two circle each other Odagiri has to try and come to terms with his past. A very real film in a lot of ways, OVER THE FENCE pushed a lot of buttons for me, I could identify with both people at the films center to the extent that after a couple of exchanges I had to stop the screener I was watching and decompress. Several seeming innocuous lines rocked me and Odagiri's line about how he was the problem for his ex knocked me back- not because of the film but because I've said something similar. I was seeing so much of myself in some of the exchanges in the film that I was considering not reviewing it. Cooler heads prevailed and I let a day or two pass before circling back to try to write up the film on it's own terms. On its own terms OVER THE FENCE is a very good film. Nicely not by rote the film doesn't take the easy way out or shy away from pain. The first time that Odagiri and Yu spend the night together and he tells her abut the break up of his marriage is raw. You feel the emotion and the hesitation. Its as real a moment as you'll find in any film this year. At the same time the meandering nature of the film, a mirror to Odigiri's life, is a little too meandering. I never remained fully connected to the characters. I could click in for moments and sequences but not all the way through. There were times when I simply sat in my seat and let it drift by. Reservations aside, I really do like OVER THE FENCE a great deal. I love it's unique way of looking at the human condition but I don't think it achieves the true greatness of its best bits. Assuming you are able to luck out and get a ticket for it's Japan Cuts sold out screening I highly recommend you do so.